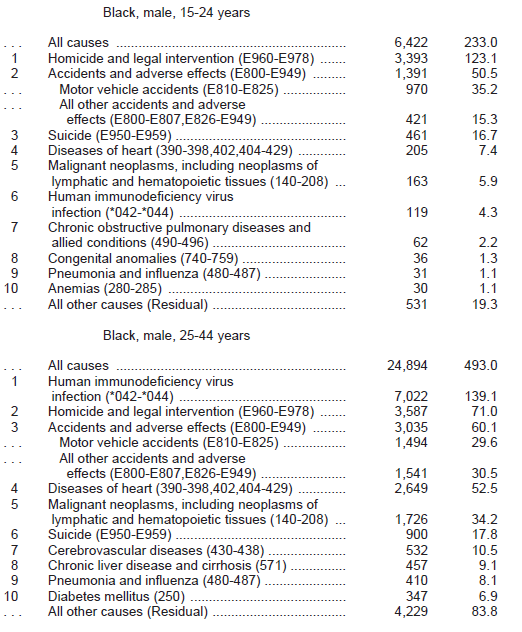 Compared to the national average, Black male youths are 31 times more likely to be murdered (123.1 vs. 4), 12 times more likely to die of AIDS (139 vs. 11.7), 44% more likely to commit suicide (16.7 vs. 11.6), almost twice as likely to die in an accident (60.1 vs. 35.8), and almost twice as likely to die in a motor vehicle accident (29.6 vs. 16.5). Every year in this country, per 100,000 population, 276 die of heart disease, 203 die of cancer, 60 die of cerebrovascular diseases, 40 die of pulmonary diseases, 36 die of accidents, 32 die of flu and pneumonia, 23 die of diabetes, 12 die of AIDS, 12 commit suicide, and 9 die of cirrhosis. 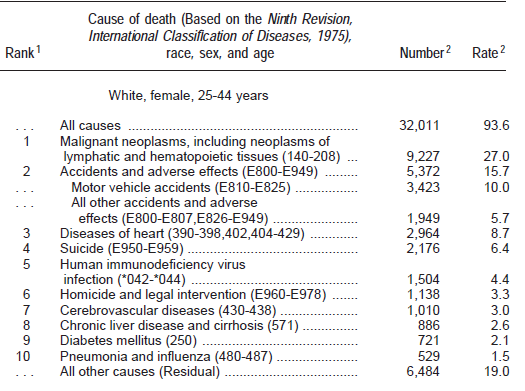 Heart disease is the cause of almost a third of American deaths (31.7%), cancer another quarter (23.3%) of them, cerebrovascular diseases another 7%, pulmonary diseases another 4.6%, flu and pneumonia another 3.6%, diabetes another 2.7%, AIDS 1.3%, suicide 1.3%, and cirrhosis 1.1%.